Every colorful page of Christopher Danielson’s children’s picture book, Which One Doesn’t Belong?, contains a thoughtfully designed set of four shapes. Each of the shapes can be a correct answer to the question “Which one doesn’t belong?” Because all their answers are right answers, students naturally shift their focus to justifications and arguments based on the shapes’ geometric properties. In the companion teacher’s guide, Danielson shows how to facilitate rich discussions and teach mathematical argumentation using Which One Doesn’t Belong? He models how to listen closely and respectfully to students’ ideas about shapes. 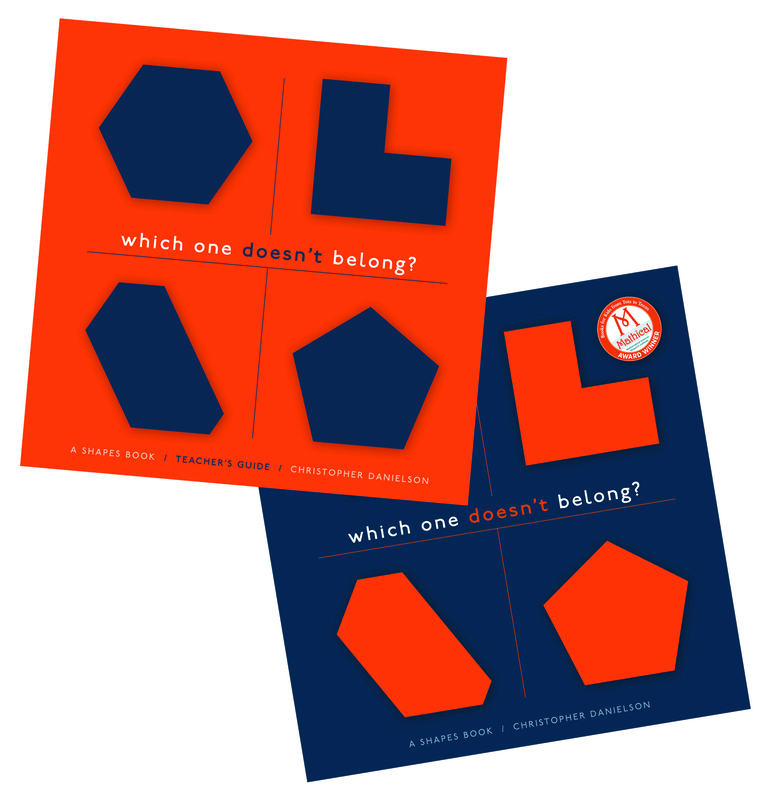 Danielson synthesizes research about how children learn geometry, discusses the role of geometry in the mathematics curriculum, and gives plenty of practical advice about different ways to implement Which One Doesn’t Belong? in classrooms. He also discusses the mathematical ideas likely to emerge on each page and—drawing from his direct experience using Which One Doesn’t Belong? at several different grade levels—helps teachers anticipate and think about students’ likely answers. Which One Doesn’t Belong? and its accompanying guide are powerful, flexible resources teachers can use to provoke lively discussions and deep learning about shapes with students of all ages. The Teacher's Bundle includes the 84-page Teacher's Guide, 36-page hardcover student book, and access to digital formats. Additional student books are available separately as single copies (hardcover) or 5-packs (softcover). Click here to order additional student books. 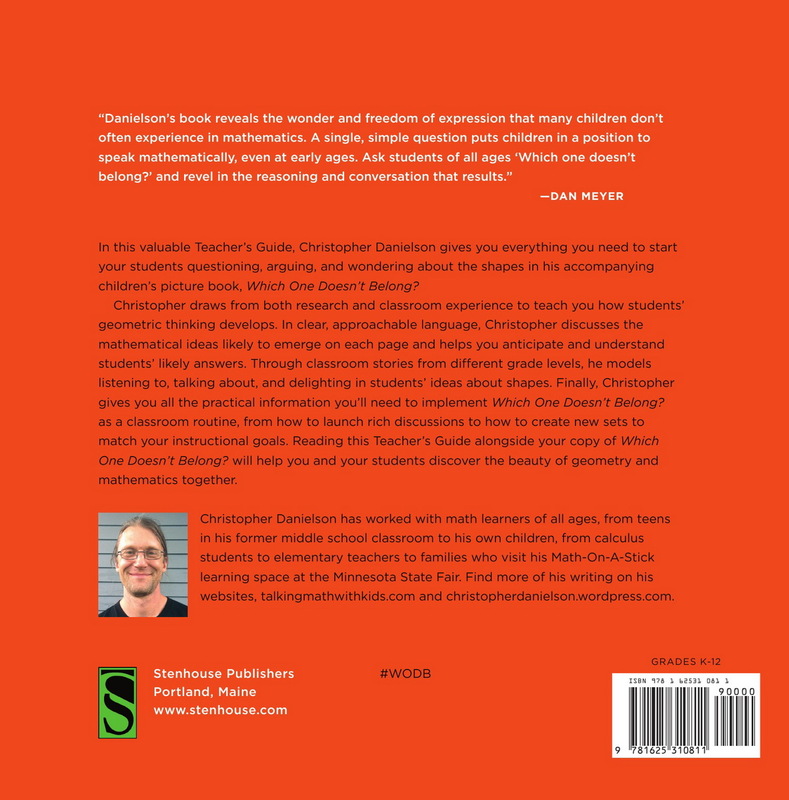 Danielson's book reveals the wonder and freedom of expression that many children don't often experience in mathematics. A single, simple question puts children in a position to speak mathematically even at early ages. Ask students of all ages ‘Which one doesn't belong?’ and revel in the reasoning and conversation that results. How can I recommend this highly enough? Christopher Danielson emphasizes the stimulation of curiosity and that math is about making precise things that we—and children—can informally observe, without having to learn any mathematical language first. Which One Doesn't Belong? is a glorious book for adults and children to explore together, and the Teacher's Guide makes it into a profound mathematical resource.